In late 2009, the family of Sally Paxson Davis presented a Revolutionary Soldier’s wooden bowl to the Society. The bowl had been in the Paxson family for many generations, and their generosity has made it possible for the entire community to share this treasure. After receiving the bowl, the Society loaned it to the National Constitution Center in Philadelphia. 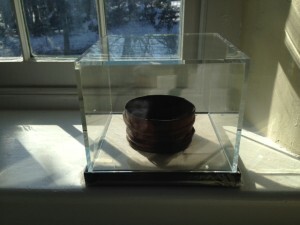 The bowl was returned to the Society and is now on display at the schoolhouse in an archival case purchased through a grant from the Lingohocken Questers Chapter #495. To learn more about this bowl and others like it, read the article by John U. Rees, former secretary of the Society, that appeared in the Winter 2010 edition of the Solebury Chronicle, the Society’s Newsletter. To see the bowl, stop in the schoolhouse any Wednesday afternoon from 3 to 5.